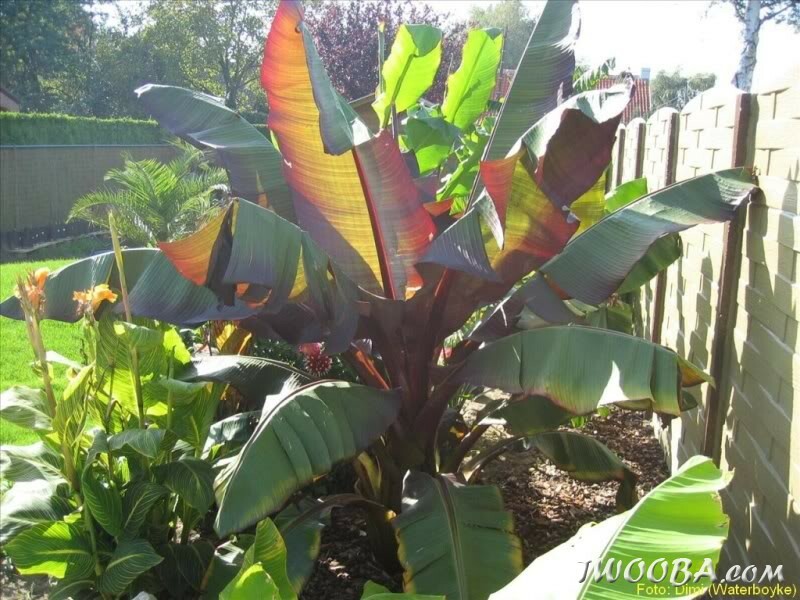 Foliage: banana-like leaf blades of up to 5 m (16 ft) tall by 1 m (3 ft 3 in) wide, on the top varying from green-red/purple and underneath deeply red. This banana doesn’t produce pups in normal circumstances. Only when the main stem is cut down it will produce a lot of pups. 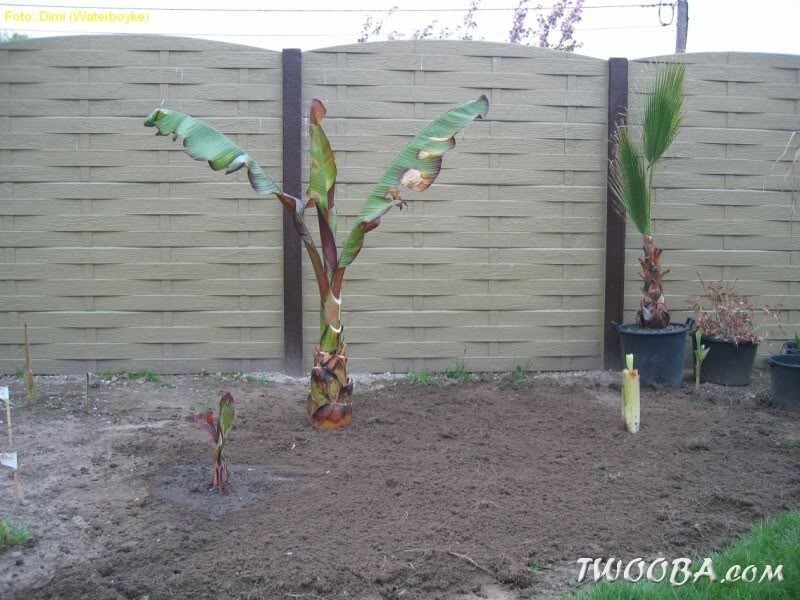 These pups can be separated and planted in a container. 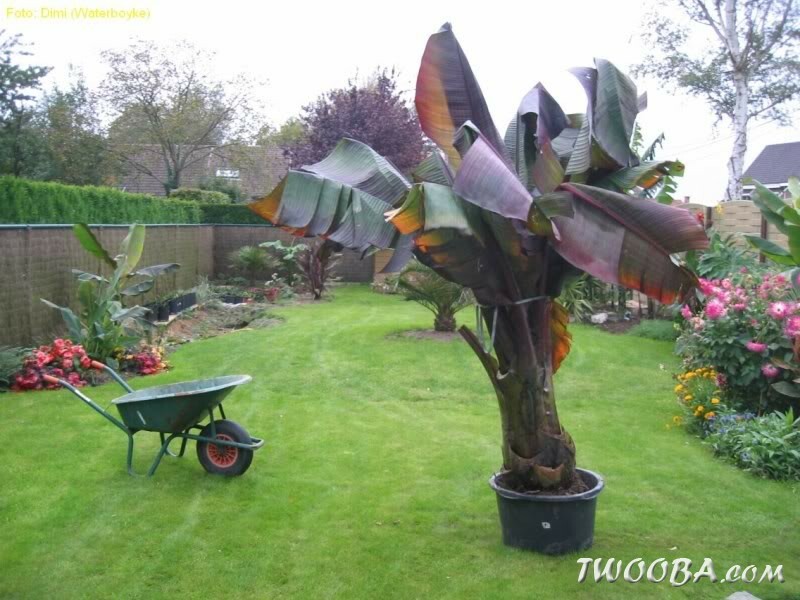 This very fast growing banana is extremely easy in care. 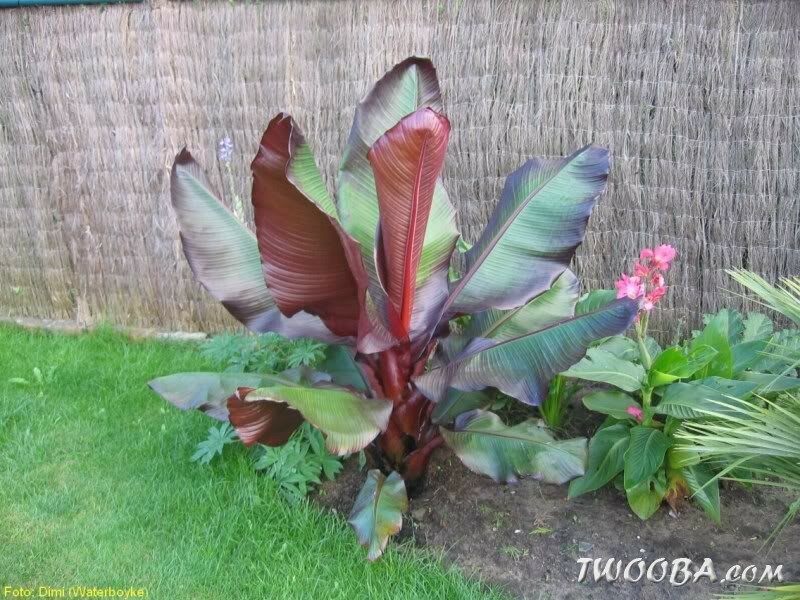 Both in pot and in the ground, but is does need enough heat, water and nutrients. Overburden is virtually impossible. 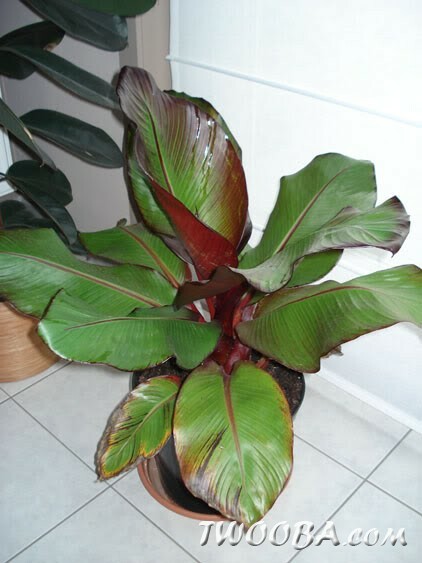 The color of the leaves varies from green-vine to purple, depending on the plant’s location. 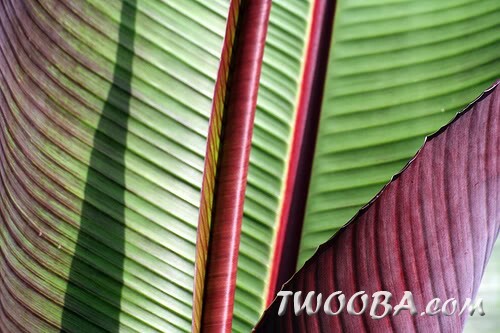 However, the opinions and experiences are divided between whether it is the sun or just the shadow that causes the red color. 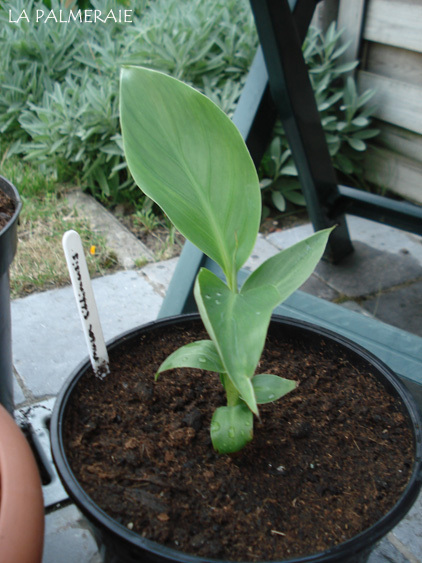 The Maurelli has a remarkably small root root and can thus remain in a relatively small pot. 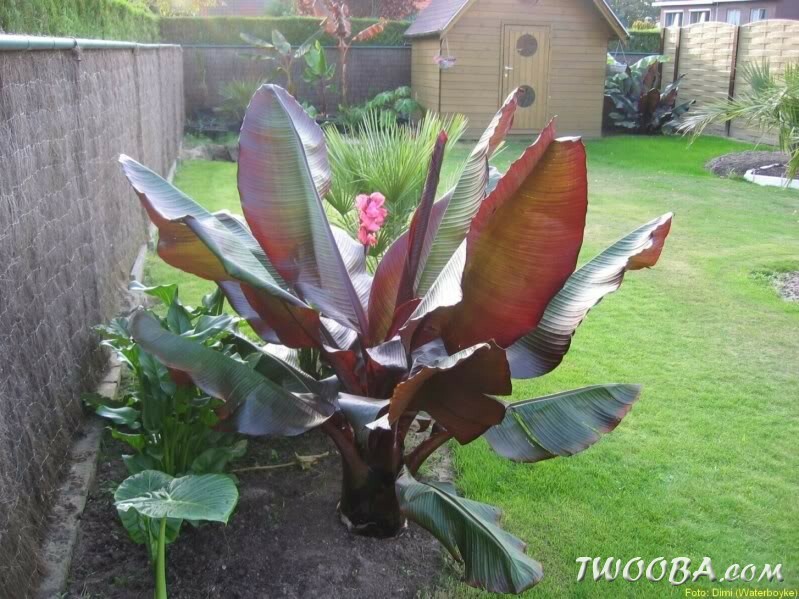 Because its large leaves catch a lot of wind, however, a larger or heavy pot is highly recommended. 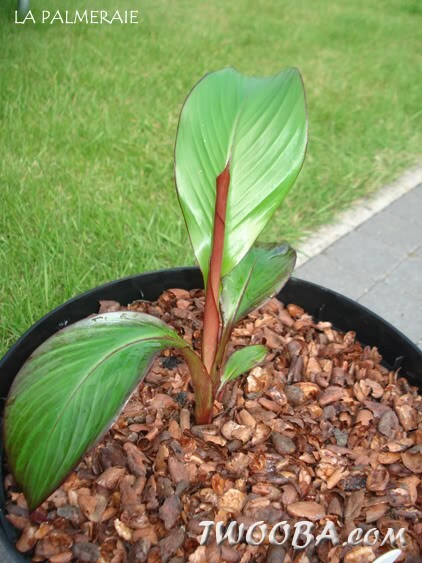 The Ensete ventricosum ‘Maurelli’ is not hardy. 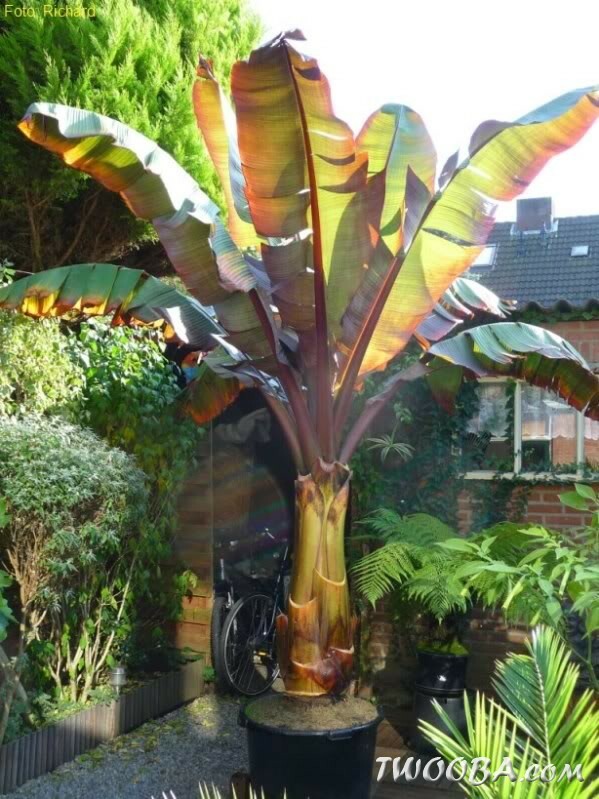 Even before the first frost he must be taken inside. The most successful method for this species appears to excavate and keep it completely dry all winter. 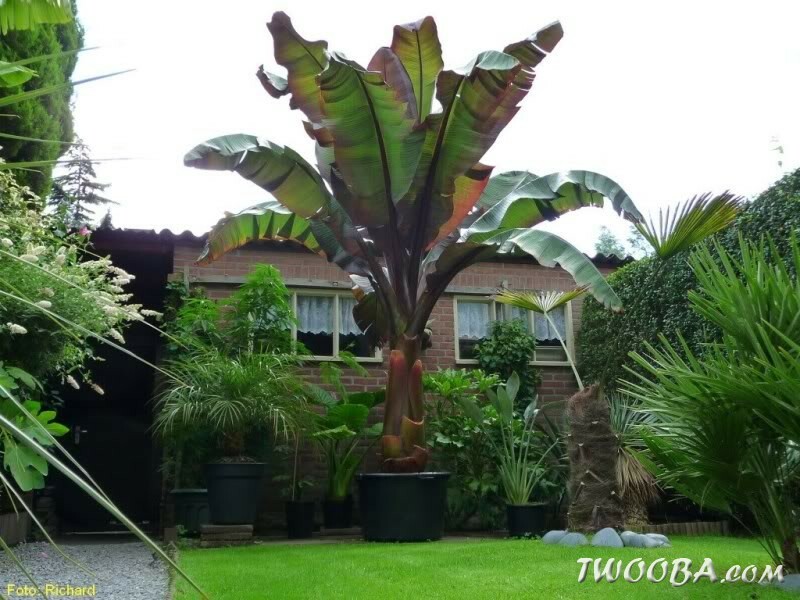 After pruning all the leaves, the plant must be laid upside down for a while so that all moisture can flow out of the petioles. 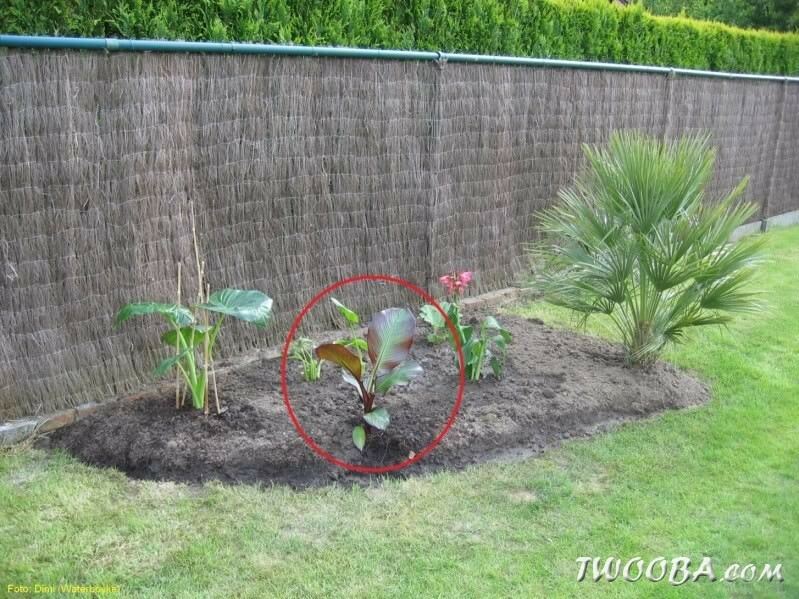 Afterwards, the plant can be placed in a dry, well-ventilated and frost-free place. No water should be given until spring! 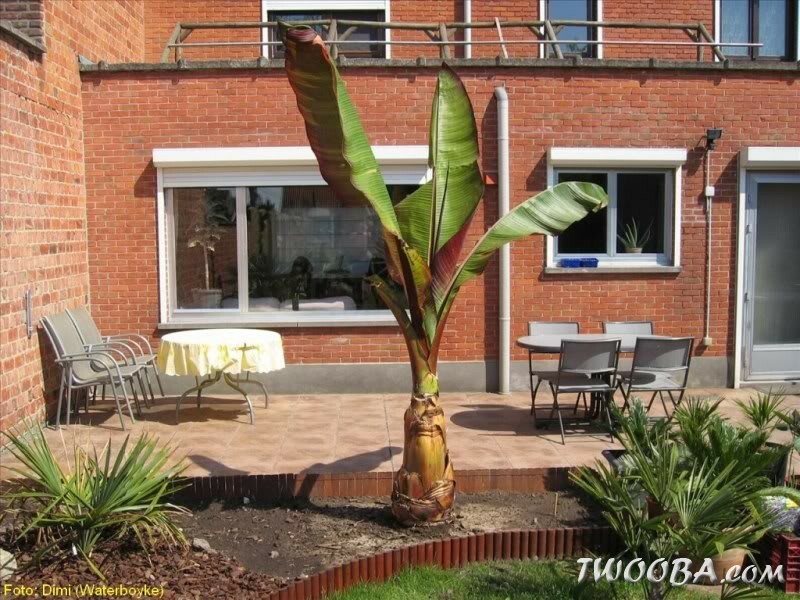 In spring, when the temperatures are high enough, the plant can gradually be placed outside again. Only when the Maurelli is growing again, you can also take up watering as well. 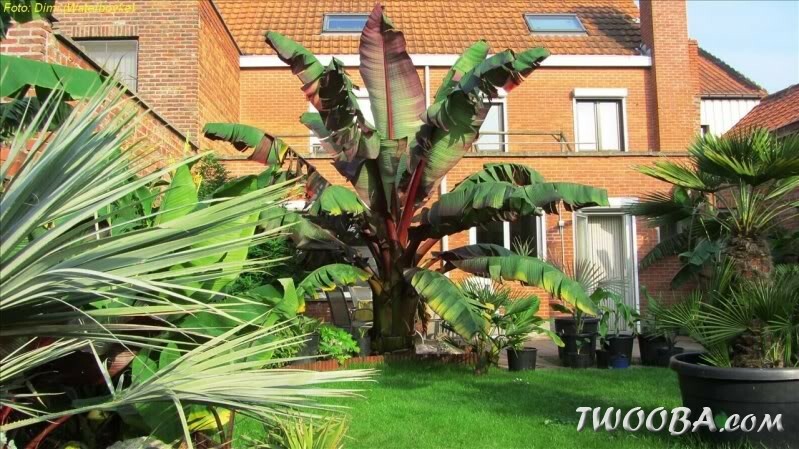 Also see: Hoe bescherm ik mijn bananenplant in de winter? 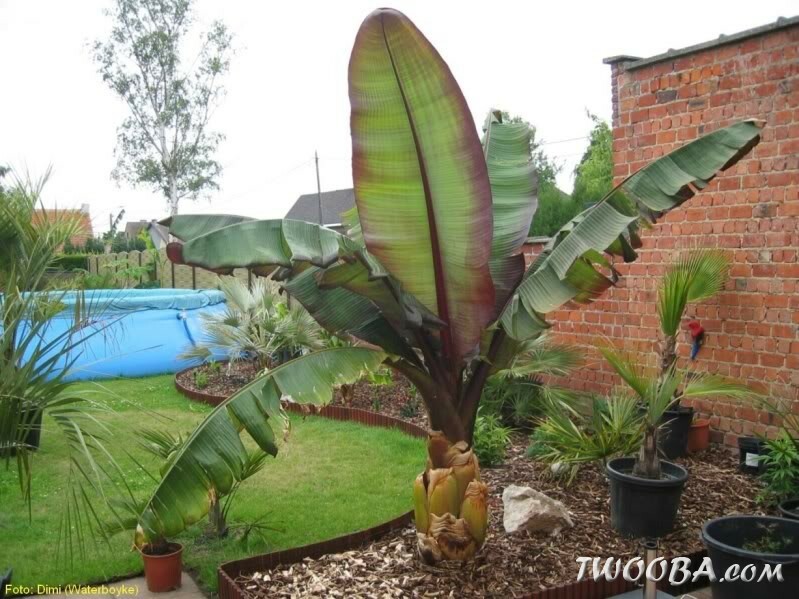 Only in Ethiopia is this banana grown for its nutritious tubers. 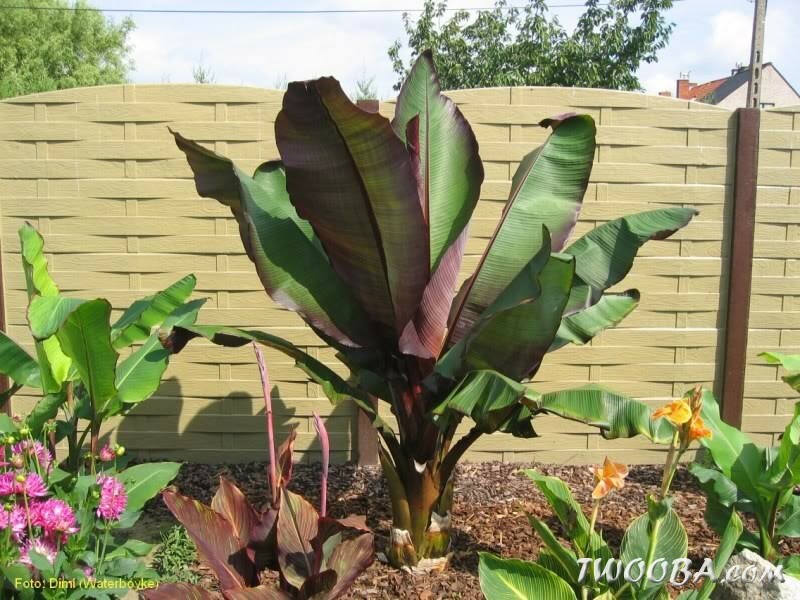 Elsewhere, the Ensete ventricosum ‘Maurelli’ is grown mainly for its ornamental value.